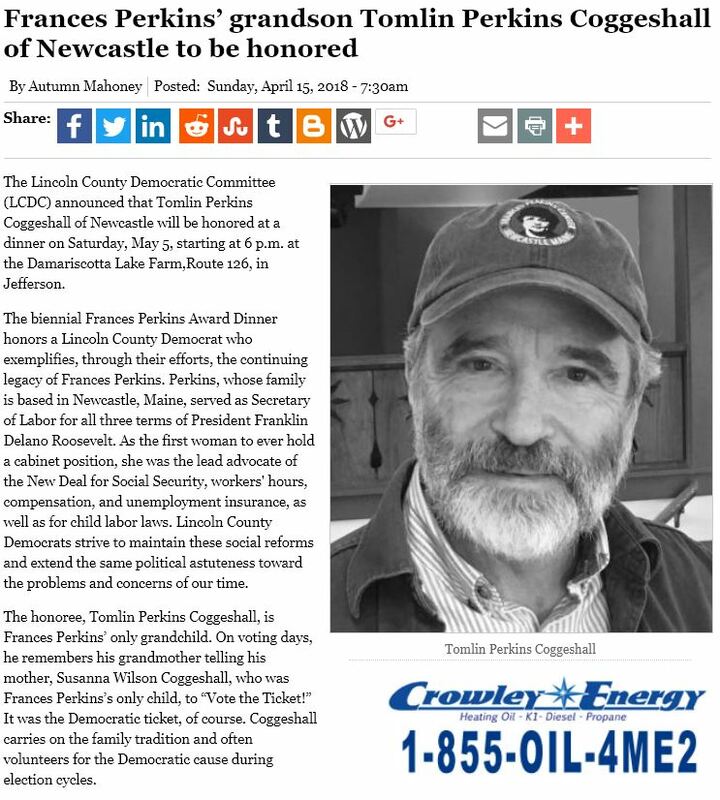 The Lincoln County Democratic Committee (LCDC) announced that Tomlin Perkins Coggeshall of Newcastle will be honored at a dinner on Saturday, May 5, starting at 6 p.m. at the Damariscotta Lake Farm,Route 126, in Jefferson. The biennial Frances Perkins Award Dinner honors a Lincoln County Democrat who exemplifies, through their efforts, the continuing legacy of Frances Perkins. Perkins, whose family is based in Newcastle, Maine, served as Secretary of Labor for all three terms of President Franklin Delano Roosevelt. As the first woman to ever hold a cabinet position, she was the lead advocate of the New Deal for Social Security, workers’ hours, compensation, and unemployment insurance, as well as for child labor laws. Lincoln County Democrats strive to maintain these social reforms and extend the same political astuteness toward the problems and concerns of our time. The honoree, Tomlin Perkins Coggeshall, is Frances Perkins’ only grandchild. On voting days, he remembers his grandmother telling his mother, Susanna Wilson Coggeshall, who was Frances Perkins’s only child, to “Vote the Ticket!” It was the Democratic ticket, of course. Coggeshall carries on the family tradition and often volunteers for the Democratic cause during election cycles. 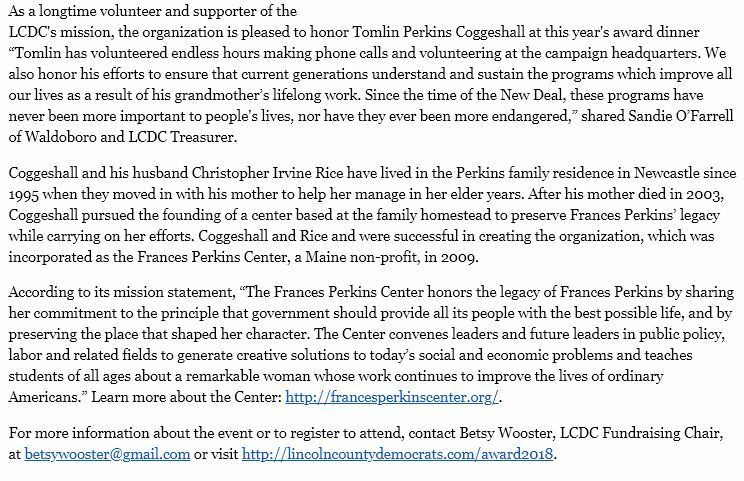 As a longtime volunteer and supporter of the LCDC’s mission, the organization is pleased to honor Tomlin Perkins Coggeshall at this year’s award dinner “Tomlin has volunteered endless hours making phone calls and volunteering at the campaign headquarters. We also honor his efforts to ensure that current generations understand and sustain the programs which improve all our lives as a result of his grandmother’s lifelong work. Since the time of the New Deal, these programs have never been more important to people’s lives, nor have they ever been more endangered,” shared Sandie O’Farrell of Waldoboro and LCDC Treasurer. Coggeshall and his husband Christopher Irvine Rice have lived in the Perkins family residence in Newcastle since 1995 when they moved in with his mother to help her manage in her elder years. After his mother died in 2003, Coggeshall pursued the founding of a center based at the family homestead to preserve Frances Perkins’ legacy while carrying on her efforts. Coggeshall and Rice and were successful in creating the organization, which was incorporated as the Frances Perkins Center, a Maine non-profit, in 2009. According to its mission statement, “The Frances Perkins Center honors the legacy of Frances Perkins by sharing her commitment to the principle that government should provide all its people with the best possible life, and by preserving the place that shaped her character. The Center convenes leaders and future leaders in public policy, labor and related fields to generate creative solutions to today’s social and economic problems and teaches students of all ages about a remarkable woman whose work continues to improve the lives of ordinary Americans.” Learn more about the Center: http://francesperkinscenter.org/. For more information about the event or to register to attend, contact Betsy Wooster, LCDC Fundraising Chair, at betsywooster@gmail.com or visit http://lincolncountydemocrats.com/award2018.